Dear god, make me a miracle cake, so I can fly far, far away from here. On a late fall Saturday early evening, I walked east on Central Park South, taking in the regal park on one side and the stately buildings on the other. It was a crisply chilly evening, but in a refreshing, exciting way. Winter is coming, the thought of the holidays is coating itself to consciousness, and the magic of jesus and snow tantalizes. To Lady M I headed, a boutique bakery which now has three locations in New York. This shop is a cream lovers' haven, a refuge for those who seek solace in cream, a temple of luscious whipped clouds of dairy. I went for their pumpkin "nuage," some sort of creamy pumpkin pie-like dessert. 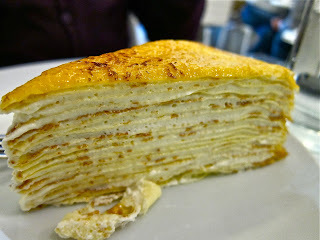 It was sold out, so I was forced to have a vanilla mille crepe cake. What is such a thing? It's a jewel of a cake - I hesitate to call it a cake for it is so heavenly it deserves to be in a category all its own, it deserves to be beyond categories - consisting of layers of the most luscious, decadent, perfectly calibrated cream, alternating with layers of the most delicate, tender pastry. It's like a thousand kisses from god, a thousand whispers from kangaroo angels. The pastry provides a subtle, supple contrast to the cream, yet the pastry is so thin and expertly concocted, it's as if the pastry is itself a cream! It is truly a cream dessert for the ages.